Who stepped up to the plate? It’s a good thing Russia never held as many US Treasury securities as China and Japan. The scenario would have been different. The “grand total” of US Treasury bonds, notes, and bills held by official foreign investors (central banks, governments, etc.) and non-official foreign investors rose by $44.6 billion to $6.17 trillion at the end of May, according to the Treasury Department’s TIC data released Tuesday afternoon. This is in the middle of the range of the past 12 months. But Russia stands out by its sudden absence. 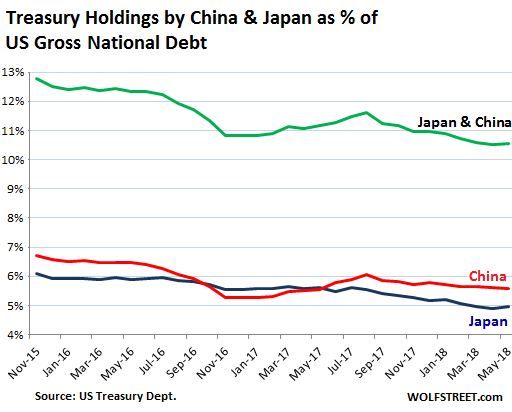 Russia was never a large holder of US Treasuries, compared to China and Japan. In March it was in 16th place with $96.1 billion in Treasury holdings. In April, it liquidated $47.4 billion of its holdings, and ended the month with $48.7 billion. That was down 69% from May 2013 ($153 billion). It knocked Russia into 22nd place behind the UAE and Thailand. 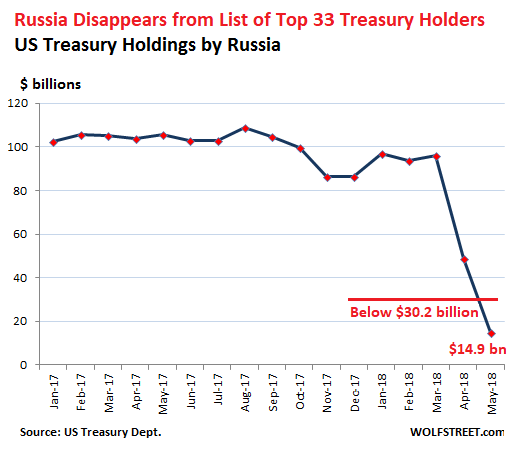 And it May, Russia liquidated more of its holdings and disappeared entirely from the TIC’s list of the 33 largest foreign holders of Treasuries. The smallest one on the list was Chile, with $30.2 billion. Russia’s holdings fell below that amount. If there was a message in Russia’s liquidation of US Treasuries, it was a pitch in the water: The 10-year Treasury sell-off that had started last September peaked with the 10-year yield at 3.11% on May 17. Since then, the 10-year Treasury has rallied under heavy demand, and the yield has fallen – hence the handwringing about the inverted yield curve. Cayman Islands: $186 billion… down from $250 billion in April 2017! Germany, the fourth largest economy in the world and running a huge trade surplus with the US, held only $78 billion in Treasuries in May. Who are the remaining creditors of the US? $6.17 trillion (29.2%): foreign entities (see above). $6.86 trillion (32.2%): Americans as institutional and individual investors, directly and indirectly, through bond funds, pension funds, and other ways. The two-year Treasury yield, at 2.62% now exceeds the S&P 500 dividend yield of 1.8%. Neither can keep up with rising consumer price inflation as measured by CPI (2.9%). But for dividend investors seeking to limit their downside, short-term, liquid, risk-free assets such as Treasury notes with two-year maturities are suddenly a valid option. This makes Treasuries desirable, in an era where 2-year government bond yields are still negative, as in some Eurozone countries and Japan. Looks like the FATCA crackdown is working…. Dumping debt that is going to be printed away by the Fed and buying gold instead – the ultimate antidote to central bank currency debasement – is going to be seen as a genius move once the Fed’s financial house of cards implodes under the weight of its own fraud and artifice. It appears the market prefers real estate near oceanside cities. There is a limited supply of it, just like gold, but you can actually live in the real estate and appreciate the view. Looking at the sunset every night is better than staring at a nugget of gold. Granted, gold may be more liquid. I hate southern californias traffic,,,it is like an illness ,,,always traffics for hours …and sometimes days.. Wealthy cities will build increasingly sophisticated sea walls. Not an issue. Sea walls are well known to reflect and amplify the power of waves, storm surges, wind, and other weathering forces, magnifying the erosion of beaches and whatever it was that was attractive about living near the ocean. They also wear down and suffer failures. Most importantly, if that coastal property is fundamentally located close to sea level, just a slight storm surge at high tide will definitely put that coastal property totally UNDER WATER. Our friend Mr. Gravity will not be able to help you here, to drain that excess water downhill, because there will be no downhill. Your very expensive coastal property will be at the same level, if not lower, than the surrounding seas at high tide, during a storm surge. The only thing that a sea wall will accomplish in the face of massive rain and coastal flooding is to keep that water trapped in place for a longer period of time than if there were no sea wall. So, by all means, please do spend a few million dollars of your money and build your sea wall. Just don’t fob it off on your fellow taxpayers. One worry about pricy real estate as a long term investment: property taxes. Chicago pushed through real estate tax increases in the past to help balance their budget & cover pension shortfalls. 10 years down the line when CA is paying a lot more of the pricy pensions for public sector boomers, they’ll be tight on cash and see the high property values as an untapped piggy bank. Prop 13 capped all real estate values in California at 1% of the last sales price of the house, with another cap of no more than 2% per year rise in assessed property values. This is a terrific deal for all Californians. A house sold for $1 million has taxes of only $1000 a year, and that assessed value can only go up 2% per year. I’m pretty sure Prop 13 is the Third Rail of California politics. Nobody has dared touch it for 40 years. You are correct, I messed up on the math. On a $1 million dollar home, the initial taxes would be $10,000 a year or about $833 a month. Yes, you are correct, there are lots of special assessment districts that add additional taxes. When I lived in Southern California, there was one for the local school district. However, these special assessment taxes are voted upon by the local community. And every community is different in what they can afford and are willing to approve. So I still don’t see Prop 13 going away after 40 years. People have gotten used to that little perk. And it’s really shocking when you move away from what most people deride as “high tax Blue State California” to a Red State where the property taxes are humongous. Ultimately, Red States get their taxes too, through high property taxes, tolls to use roads, higher fees in general. taxes to sell and buy high for houses. And houses can also go down. If needed 10 000 usd esay to sell some goldcoins,instead of taking new loans. People have used their houses as a cashmachine. Or they’d rather have the cash due to US sanctions and low oil prices while as icing on the cake making a political statement? Do these figures refer to governments of these countries, or govt and private holdings of Treasuries? They include all of it, “official” foreign investors such as central banks, governments, etc. and non-official foreign investors such as companies, funds, and individuals. Russia figured that the FED cannot print gold like it can fiat. This is a bet that the over-indebted system will eventually have to raise rates which would devalue existing holdings. You mean you can’t buy gold with printed money? It must be because US and Russia will get together to stand against China. > Someone somewhere actually wrote that yesterday. Americans might like the idea. But Russians don’t, and won’t. And nothing Americans say can possibly change that, because the Russians and the Chinese are fully aware that Americans will say anything that they think will give them an advantage. And then renege on it tomorrow. +1. Russia knows that once China is under America’s control, the Russian will be next. Murican politicians can’t be trusted. They’ve reneged so often at home. America = Not agreement capable .. at least currently. I live next to some Russians, Americans pretty much think the same of them plus their cigarettes reek and they don’t do jack in the neighborhood, bad contractors too…..
Now the big deal is: what if China dumps its treasuries of about 1.2 trillion? This US economy is 22 trillion in the hole and thanks to this bizarre so- called tax cut is due to hit a DEFICIT of one trillion PER YEAR. It is adding roughly what it owes China every year all by itself. So if China wants to get paid out it gets 1.2 T US$. The good news would seem to be a weakening of the US $ and a rise in the yuan, both sought by the US. So if someone wants to explain how the catastrophic debt situation of the US is supposed to get qualitatively worse by China doing this, I’ll listen. Russia got rid of 100 billion, the Fed 171 billion, China and Japan are trending down and the deficit is up 400 (?) billion. Who is buying to keep the 10 year interest rates down? It does not add up. Americans are buying! And total foreign ownership is up too (by $44.6 billion from prior month). As long as short term Treasury Bills pay more interest than my savings account I will continue to be one of those buyers. I can hardly believe that nearly two years ago the converse was true. Corporate America? The tax bill provides the incentive? I don’t mean to quibble but your statement about the S&P 500 returning a dividend yield of 1.8% seems a bit on the high side. Over the last year I’ve received dividends from my SPY holdings of a smidge under $4.60 per share and at today’s closing price of around 280.5 that works out to about 16.3%. True enough that some of the dividend is used to cover the cost of running the fund, but this is a tiny percentage. One could argue that dividends will continue the inexorable rise (and you won’t get an argument from me) but the fund will also continue it’s inexorable rise and likely outpace dividend increases. No need to worry about the Russians, we all know of a willing buyer at the ready, with a limitless supply of dollars, to purchase as many treasuries as our current government needs to meet it’s expanding budget and shrinking revenue. This willing buyer also sees dollar devaluation as a wonderful benefit to us all, so you see by buying treasuries, once again, they will be helping everyday citizens by devaluing the dollar and helping the government to expand and grow at a healthy clip – win, win!!!! Typo? I guess you mean 1.63% ($4.60/280.5), not 16.3%. How does this episode affect forex trading? >Germany, the fourth largest economy in the world and running a huge trade surplus with the US, held only $78 billion in Treasuries in May. So, stupid question from a lay person. The US trade deficit with Germany must be financed somehow, right? So if the Germans are not buying Treasuries, what are they buying then? Stocks? Or are those Treasuries held in tax heavens, instead of German banks? Or are other EU countries holding Treasuries (say capital flight from Italy/Spain), thereby weakening the Euro, from which German export companies profit? It’s just a matter of preference. They don’t have to hold dollars. Dollars convert quite easily into other currencies, such as the euro, and non-dollar denominated assets. Consider, Russia’s economy is smaller than Canada….indeed, smaller than Texas. Russia is moving backwards by almost every metric, lowest life expectancy in Europe, negative population growth, and an economy that relies on over a third of its gdp exporting a dwindling supply of hydrocarbons, social upheaval is no doubt in the cards in the not-so-distant-future. They’re dumping treasuries because they need to. They are broke . The simplest explanation is usually the correct one. Also, I wouldn’t be surprised if they moved at least a large portion into crypto. Sounds like yet another, failed strategy. Yes, few of our fellow citizens really pay attention to the cold hard facts. Russia is quite weak by every measure except maybe military. And that’s probably only in the WMD/Nukes area. Russia is actually a sad case, if you understand the average Russian’s life (also vs. what it could/should be). The USSR breaking up with the knock-on effects of international distrust has really hurt them. In addition, the past few years of sanctions, etc. continues the beat-down. (The US has closed embassies, deported diplomats, raised sanctions, destroyed Russian military assets (including people), in the past 18 months- but few seem to want to understand that). About the only thing the US has to “fear” from Russia is a nuclear exchange. As for their near neighbors, they have more to fear, but the past 10-15 years have seen significant mismanagement of this situation by the US and NATO. Let’s hope for a better future. China is much more of a problem for the USA than Russia. Not to worry, the EU will bail Russia out, along with Iran. Putin and his oligarch buddies have a lot of cash stashed in US stocks. They are just doing their bit to prevent a yield curve inversion that could crash the market and cost them a lot of rubles. Thanks, everyone. I will be at Zerohedge all week. Try the salisbury steak! Item 2 and 3 are arm of Government itself (or at least without Government they don’t have an existence)! So it it safe to assume the total debt as 29 trillion rather than 21 trillion? The true debt picture is opaque, as unfunded liabilities in the real world = debt. In addition, with the Fed backstopping its TBTF bankster accomplices with Yellen Bux and moving non-performing loans to the public ledgers, i.e. the $2.3 trillion in toxic waste MBSs that they took off the hands of their bankster pals, the true figure could be exponentially higher than $21 trillion. That’s why a real audit of the Fed (by real auditors) is imperative to characterize the full magnitude of the Wall Street-Federal Reserve Looting Syndicate’s swindles against the 99%. No. The US government outstanding debt was $21.1 trillion at the end of May. We need to separate the Fed from the government. The Fed owns marketable Treasuries that are traded in the markets. The government may hold securities that may not be marketable. It’s the same debt and the same obligation but it’s just not a marketable security (such as the $2 trillion invested by the SS administration into US debt). The Treasuries that the government holds “internally” are an investment of moneys the government received from people and entities paying into the system. The government owes this money to those people and entities. So it’s true government debt and doesn’t disappear just because the government holds it internally. A better of looking at this is which part of that debt is controlled by the markets and subject to market forces = $16 trillion ($21.1 trillion minus the $5.7 trillion that the government holds internally) and which part of the debt is beyond the reach of market forces = $5.7 trillion. In other words, every man, woman and child in the whole world has loaned the US government nearly $1,000. As is only fair considering how desperately poor the US government is, and how much surplus cash those other people have sloshing around. In response, the US government uses a large proportion of the money loaned to wage war against the people who made the loans. Does Russia actually need dollar reserves? Aren’t most of its imports in Euros, or barter for energy, or couldn’t they be? I can only tell you their trading partners won’t want rubles. Barter is a last resort but is usually associated with REAL basket cases like Venezuela. Most Russian imports are from EU, China. So why not pay the Europeans in Euros and/or gas, and the Chinese in energy. No rubles involved. No dollars either as far as I can see. I see Russia uniquely positioned to be off the dollar system to a large extent. So Treasuries not needed. China was forced to liquidate one trillion in treasuries a few years ago, and it didn’t even create a blip on the screen. People think that treasuries can somehow be “cashed in”, whatever that means, or that the U.S. will have to hand over all of its factories if China decides it wants them. That’s not the way it works. Even people who should know better think that selling foreign reserves is some kind of insurance against a weakening currency, which is also wrong, because when the next crisis hits, every EM in the world will be doing the same thing, and it has never worked before. In reality, large foreign reserves are nothing but the result of various forms of mercantilism. The treasuries are pretty much worthless entries on a computer program. Trade surplus countries are setting themselves up for a fall, yet somehow their sense of entitlement will convince them that the U.S. should bail them out. Good luck with that. 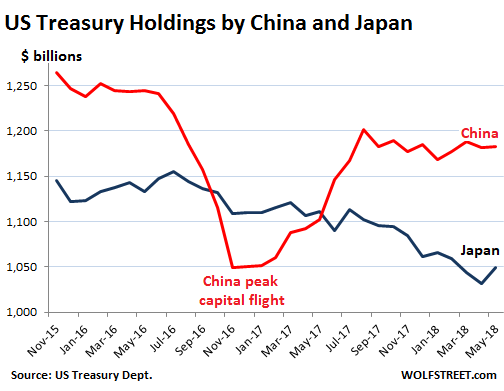 China did liquidate a bunch of Treasuries during the peak capital flight episode indicated in the chart, but it wasn’t $1 trillion. It liquidate $200 billion. That’s still a lot. Sorry, I forgot about the other currencies China also holds. Looks like Turkey is dropping off the list as well. Are we losing Turkey as an ally? So leading up to the historic summit Russia dumps all its US Treasuries? I don’t like the sound of that. The Russians are by source said to be preparing to meddle again in the midterm elections. According to this link from the Treasury TIC site, Russia now only holds $14.9 billion of American treasuries. excessive debts. Many countries are following suit to that too. Russia is reportedly buying gold at these bargain-basement prices. If China follows suit – dumping USTs to buy physical precious metals – things are going to get interesting real quick. So much for the “$US is doomed”, seems to be one of the cleanest shirts in the dirty pile. Official national debt has risen about 8.8% per year since 1913. The exponential rate of increase since 1971 has been about the same. Given the recent tax cuts and spending increases, the probabilities for new wars, and the likelihood of an over-due recession, debt will increase at the same 8.8% per year or faster. Real inflation is probably running close to 7% a year. So why would Foreign Govenments or any one else buy U.S. Treasuries at 3%?